Silliness aside, A.J. 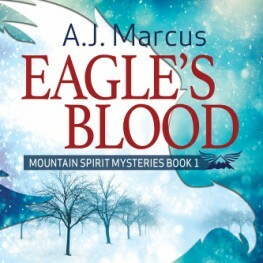 was kind enough to take the time to talk about his new release, Eagle’s Blood (Mountain Spirits Mysteries Book 1), weather-as-inspiration and the wonders of nature. Brock Summers is a Colorado Parks and Wildlife Officer who loves his job and takes it very seriously. When he discovers a video of golden eagles being shot and learns of a nest in trouble, not even a blizzard can stop him from trekking up the mountain in an attempt to rescue them. When Brock returns with the one eaglet he manages to save, Landon Weir, the local wildlife rehabilitator, patches up the bird and the injury Brock suffered during the rescue. Though they have been friends and colleagues for years, they discover a shared passion for protecting wildlife and vow to work together to protect the majestic birds from the criminals preying on them. It isn’t long before another video of eagles being killed comes to their attention. They must face inclement weather, a dangerous mountain, and armed poachers if they want to ensure the eagles’—and their own—survival. Buy links, etc., can be found at the end of this post, so let’s get to the good part. Carole: Okay, first, why don’t you tell us about your genre. A.J. : Mystery Suspense can mean a lot of things to different people. To me it’s all about the unknown, and sometimes that’s not exactly the who dunnit so much as the why and having the hero ride in to save the day. A.J. : I write in the gay genre because I think we need more stories for folks to read. It’s also about helping more people find acceptance in themselves and in others. There are a lot of books out there to tell straight folks that they are good and normal, but in the past there haven’t been many books that tell LGBT folks that. I hope that my writing can help with that. Carole: Tell us about Eagle’s Blood. A.J. : Eagle’s Blood is the story of two men who bond over their mutual love of nature and their need to care for the creatures that share our world with us. Carole: Eagle’s Blood is being published through DSPP, Dreamspinner Press’s imprint for nonromance genre novels. Tell us about the relationship in Eagle’s Blood and why it doesn’t fit the accepted definition of Romance in the M/M genre. A.J. : One of the definitions of a romance novel that I read early on is that if you take out the romance in the book, do you still have a story. If you do, then it’s not really a romance. In Eagle’s Blood, there is a romance aspect to it. Brock and Landon, after knowing each other for several years, are finally making the love connection. But that’s not all the book is about, it’s only a small part of the book as these two try to save eagles from poachers. You can pull out the romance from the book and you still have a riveting, on the edge of your seat, mystery suspense novel that readers have difficulty putting down. I like to think that there are some aspects of Tony Hillerman’s writing as I show the area where I live and the critters that I love in my work the way he shows the Navajo reservation in his. Sometimes with a good mystery the setting is a key element. Carole: Tell us about the evolution of this story. What was its earliest incarnation as a concept and when did it begin to take the form of Eagle’s Blood? A.J. : Where this story came from? I get so many ideas that come in from all sorts of directions. I can’t remember the actual spawning of this book. I’ve done wild bird rehabilitation similar to what Landon does. I’m a falconer like Landon is. A few years ago I ran into a completely adorable Parks and Wildlife officer who paid me a visit while I was in the shower and I met him at the door in a towel. He’s much smaller than Brock is; Brock’s a big imposing but loveable guy. I think he was the indirect inspiration for Brock. The book opens in a blizzard and when I started writing the book, there was a blizzard going on here. I have lots of windows behind my desk, it lets me critter watch while I work. But I was trying to figure out where to start and I decided to start with the blizzard and having Brock go down a cliff. About halfway through the book, I realized that there are a lot of tales I want to tell with these guys. I get some of my ideas from the news, some from friends, which include the Parks and Wildlife officer who comes out to check on my birds every so often and even goes hunting with me from time to time. Hopefully, DSPP will keep publishing these books as I keep getting the guys into lots of trouble as they go out and try to keep our wildlife safe and wild. Not to mention that a common plot that is going to string through all the books is them getting Frigga, the eagle that Brock rescues in the opening scene, ready to go back into the wild. Carole: Why did you feel this story needed to be told with the M/M dynamic? A.J. : I think gay readers need to read about characters who are like themselves. Characters who can inspire and help them grow. There will always be gay characters in my books and I hope that most of those characters are going to be examples that folks can look up to. I also hope that by embracing a nonromance genre the mainstream reading audience will embrace the books and maybe, by seeing gay characters who are just like them, it will help demystify what it means to be gay in our society. Read more at The Novel Approach here.